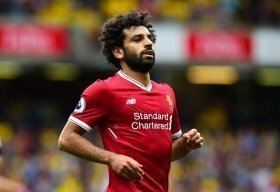 Real Madrid are reportedly planning a shock move to pursue the services of Liverpool forward Mohamed Salah in the New Year. The Egypt international has been by far the Reds' standout player this term, contributing 19 goals across all competitions. As a result, his showing has caught the eye of the European champions, who are looking add a quality attacker to their ranks in January to salvage their La Liga season. According to Don Balon, the Spanish champions will make an ambitious attempt to sign Salah at the turn of the year, and are prepared to offer Lucas Vasquez as part of a proposed move for the former Roma man. However, Jurgen Klopp's side are highly unlikely to entertain thoughts of offloading their leading performer as they themselves have the ambition to win some kind of silverware this campaign. Liverpool are pretty much out of contention for the Premier League race, and they have just the FA Cup and Champions League to hang onto to claim their first trophy in over six years. Meanwhile, Real Madrid are currently eight points behind league leaders Barcelona, and this gap could extend further this weekend with Los Blancos due to participate at the FIFA Club World Cup in the UAE.